In today’s computers, information is processed using electrical charges. Due to inherent physical limits, the shrinking of electron-based transistors to improve processing speeds is proving increasingly challenging. One approach to overcoming these limits is to replace electric currents with light. For this to work, we require tools that enable its effective manipulation. In our experiments, we exploit the strong interaction between THz radiation and a solid-state plasma. Because of this interaction, left- and right-handed circularly polarized THz waves have different refractive indices when a magnetic field is applied. 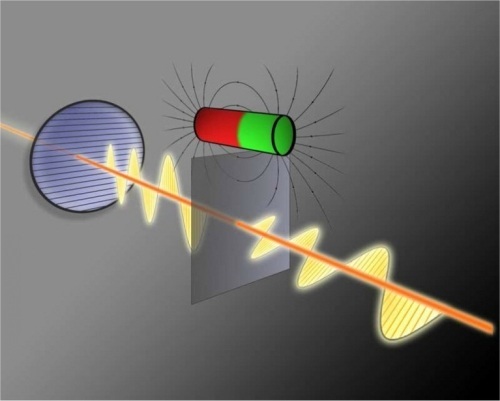 This property was recently proposed as a tool by which it may be possible to realize broadband THz modulators based on electron-doped indium antimonide (InSb) crystals.2 There are, however, two problems in realizing such devices for practical application. First, the giant Faraday effect in InSb does not survive at room temperature due to strongly enhanced carrier scattering. Second, this approach requires fast modulation of a moderate applied magnetic field―several hundred milliTesla (mT)―which is technically challenging. Figure 2. Electric voltage control of THz radiation. (a) Schematic representation of experimental arrangement to control the Faraday rotation (?) and Faraday ellipticity (?) by gate voltage. A thin film of HgTe is deposited on a cadmium telluride (CdTe) substrate. 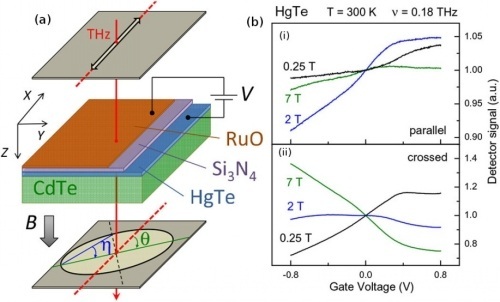 A semitransparent gate made of ruthenium oxide (RuO2) is separated from the active layer of HgTe by a silicon nitride (Si3N4) insulator. This material enables most of the light to pass through the sample while a gate voltage is applied. (b) Normalized detector signal as a function of gate voltage in a geometry with (i) parallel and (ii) crossed polarizers. B: Magnetic field. a.u. : Arbitrary units.